So, yes, I bought a little fabric in Japan. (I know you're all surprised by that.) Last Tuesday morning I went to Nippori Textile Town. Small digression: I know it seems scary, the idea of running around a strange city, by yourself, not knowing a word of the language (okay, I can say "sugoy" which I *think* means "awesome!") — but, really: it's okay. It's exhilarating, even. When you're traveling somewhere familiar you don't notice even a tenth of what's going on, because you don't have to. But when everything's strange, everything is important, and you notice every detail. The colors matter, and the expressions on people's faces, and even the flow of the air around you — they're all clues as to where you are and what you should do. If traveling somewhere so different doesn't make you feel incredibly awake and alive, you're doing it wrong. There's a lot of other stuff on the first floor which I neglected to take pictures of; mostly linen-y things. Hilariously, each floor plays different music. The ground/first floor plays upbeat J-pop; the knits floor (which I also neglected to photograph) was playing some Justin Timberlake; but the silks floor was playing classic big-band jazz. Talk about setting the atmosphere! So enough of the travelogue: what did I buy? Tomorrow: directions and photographs of the store in Nippori that sells LIBERTY. Oh, I know what you mean about how exhilarating a strange city can be! Love your shopping story and especially the brown/red/teal – yum! Must…remember…this… I am planning to go to Japan in jan next year, and this is making my eyes pop out in excitement at all the beautiful fabric. 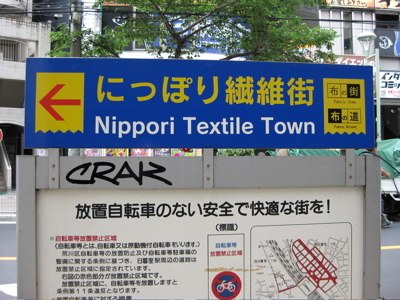 Nippori Textile Town… Nippori Textile Town…It looks like you had a great time buying fabric! Oh, that is such a satisfying photo-journey. 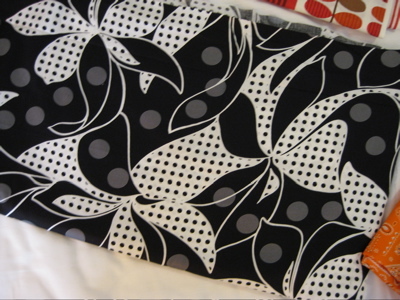 I am in love with the b/w floral polka dot, and a duro is a nify use for it. I love the thought of fabric shopping in a non-english speaking country. I can imagine the thrill of finding something so wonderful – and then trying to figure out just how much to buy knowing you’d NEVER be able to get back for more if you needed to. thanks for the great pictures! That black floral is amazing!I’d use the boldness of the print to offset a dignified, businesslike, even matronly cut then add a bold, red jacket or shawl. 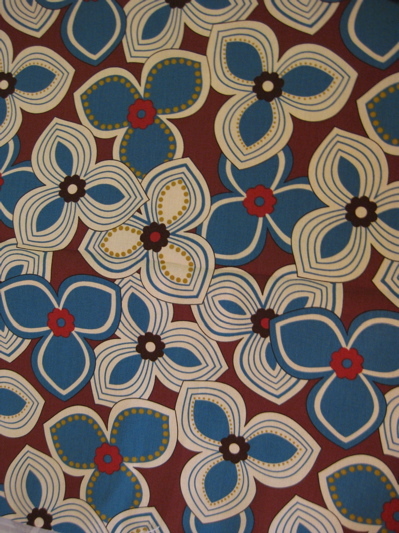 I recently discovered your blog (I LOVE your Secret Lives of Dresses).These fabrics are wonderful! Both my sons went to Japan this summer. One of them gave me a fan… But now I can convert yen to dollars…and say you got a deal on that cute cute orange paisley bandanna fabric.I used to sew a lot, but haven’t in a long time. Your blog is inspiring! Lovely! I particularly love the black and white. I can’t wait to see the FOs, especially the Duros as you have inspired me to make one of my own. I do love the bandana print..there is something similiar at Vogue Fabrics now, but yours is sooo much better! Love it, love it! Brings back many fond memories! My DH and I met in Japan while both in the Navy! A lot of times the people want so badly to practice their english on you that that can help quite a bit. 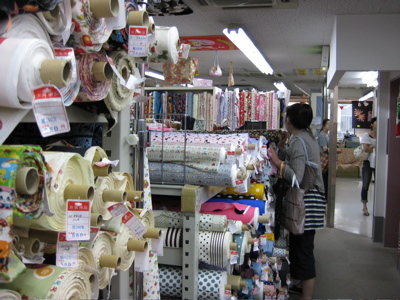 There was a place outside of Yokosuka (south of Tokyo) that as you said had different types of fabric on each floor. At the time we were pregnant! And found the floor that had nothing but childrens fabric! Amazing!!! I didn’t discover it until just before we left to come back to the states, or believe me my stash would have been quite hefty, not just kids stuff either! But by that time we were pretty much packed up and couldn’t afford a whole lot else… so sad! Enjoy, hope that your trying all sorts of fun foods! We used to go off base to the movies, and I would have dried squid instead of popcorn!!! Really good, that is if you like fishy stuff!Have fun! Guess I will live thru you while you are there! Love all the fabrics! I hope you had a great time. 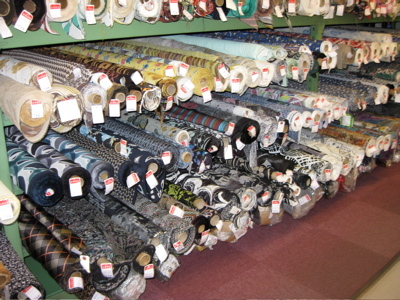 I love all the fabrics, I am so much a fabric addict. I really wish I could have been there! sigh! i’m so jealous. that place looks like heaven. The first time I went to Japan I didn’t speak any Japanese, and I was delighted to be able to successfully purchase several meters of traditional indigo-dyed cotton in a very tiny fabric shop I found by accident in a tiny neighborhood (Higashi Koenji) of outer Tokyo.When I was there last year it was with two and a half years of Japanese study under my belt, but I was unable to find that fabric store again.In addition to sugoi (fabulous) You will probably want “kore o kudesai” (koh-ray oh koo-deh-sah-ee) which means “this please”, as you hand something to a clerk for purchase, or point at something you want.And of course “domo arigato gozaimasu” (doh-moh, ah-ree-gah-toh goh-za-ee-mahs) “thank you very much”Have fun. I am envious of your awesome trip and especially that burgundy and teal print. Oh my goodness! 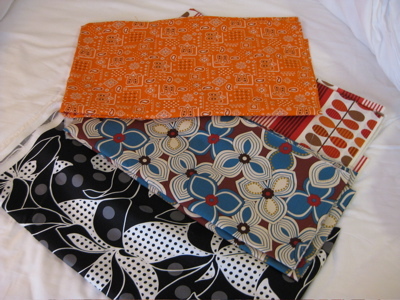 My friend who is visting Japan went to Tomato on either Thursday or Friday last week, and bought me some gorgeous fabric. I got it yesterday in the post. Can’t wait to get there myself in a couple of months. I love what you purchased! 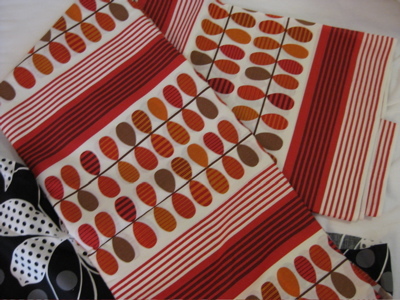 Wow that orange leaf fabric is a dead ringer for Orla Kiely! Great work here, I’m surprised you kept yourself to only 5 purchases! Oh. My. God. You have just lived my dream…only how would I ever choose what to take home with me? 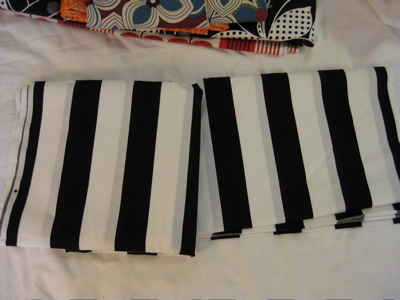 Oh my, Jilli will love thatstriped material. Wish I’d thought to have you get me some, also! No worries of doubling, we’re on opposite coasts! 🙂 -dAngldst/Donna, another stripey-loving goth. I am going to Japan in October! My sister is there for a year abroad. I am so excited. But today, I saw you article in one of those sewing magazines (Threads?) 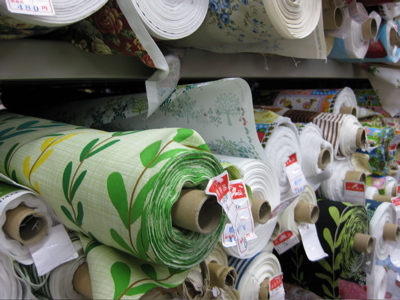 about fabric shopping in Japan so this post was total deja vu for me. Was the article about this trip? Congrats on the article though. And thanks for the fabric shopping tips. Thank you again for picking up that fabric for me! 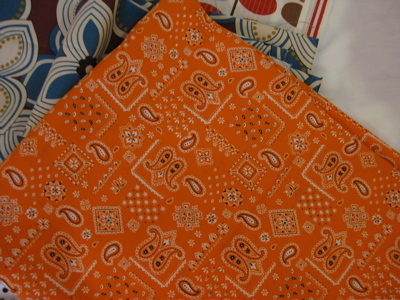 Orange bandana print! Yay! Plus how much do I love a winking tomato? You’re evil, teasing us with all these swatches.I wish I’d known you were going (I just got back from Colombia); I don’t know if you’re interested in Japanese pattern books and magazines but there’s slews of ’em. Now I’m jealous that I didn’t take any time to peruse fabric stores while I was in Japan (but the trip was for our daughter — see comment on next entry). Sigh. Beauties, especially that black and grey…Does it count that I oggled some yarn while I had my current knitting with me? I was given a bag of fabric scraps from a friend whose elderly mom is clearing things out and didn’t know what to do with them because they were so homely. This Liberty stuff mostly looks like stuff back from the 60’s like these scraps. Just when I was thinking I’m glad to be away from it!! I didn’t like it much back then either… to each his own taste. This looks like so much fun!! One of my favorite things when I was in Chiang Mai, Thailand was hunting for cool buttons . 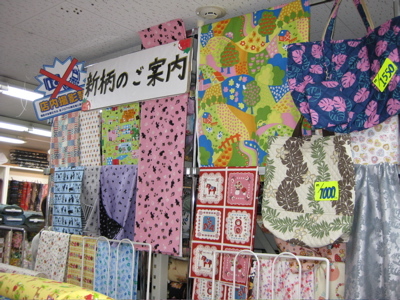 . .
On the other side of the street, there is a store with lots of japanese prints cotton fabrics… Some bundles of perfect for patchwork projects. 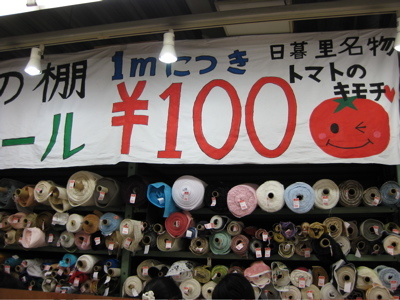 You have just made me very happy.. I’m back in Japan in March and was wondering where I could go fabric shopping!